Most of the Earth has always been covered by salt water. Starting from the late Cretaceous we begin to see the continents drifting into their modern positions. These geologic events had profound effects on global climate, which gradually became cooler and drier on average from the Eocene to the present day. Also, we see very early on how marine animals recovered following the devastation of the late Cretaceous and achieved its modern composition. Unlike terrestrial or freshwater animals, marine animals are able to achieve a truly worldwide distribution because there are no barriers to obstruct their expansion. As a result, many oceanic species are quite long-lived. 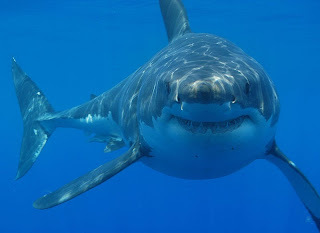 The modern Great White Shark, for example, has existed for at least 16 million years, and its relative Megalodon was around for 28 million years. waters all over the world during the late Paleocene. The oceans all around the globe were warm and free of ice during the Paleocene. As a result, sea levels were much higher than they are today: much of the eastern United States lay at the ocean floor and Europe was a series of volcanic islands similar to Indonesia. 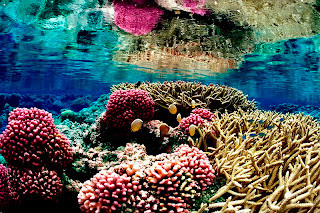 The early Paleocene featured a low diversity and abundance of marine life, the flora and fauna still recovering from the ravages of the K/T extinction event. Sharks became the top predators after the extinction of the mosasaurs. Penguins evolved 63mya, replacing the Hesperorithid birds of the late Cretaceous. 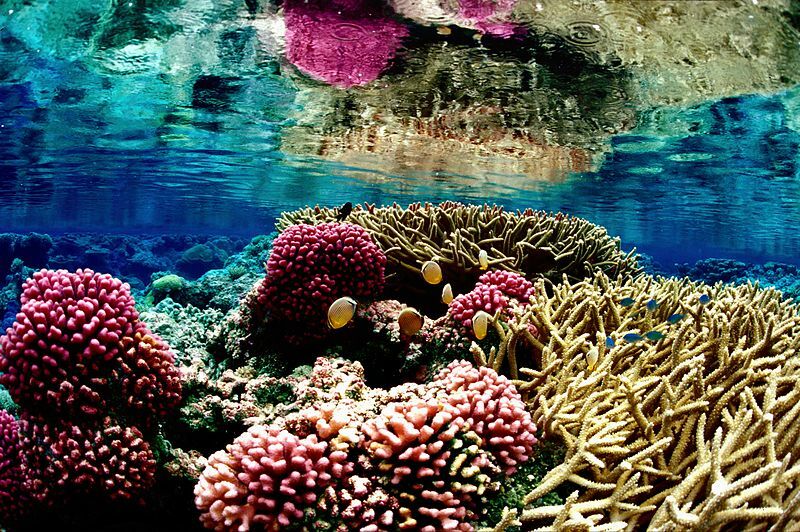 Coral reefs could be found in all oceans. Apart from the absence of marine mammals and Carcharhinid sharks, the marine fauna of the late Paleocene would have been very similar to that found in tropical seas today. Tropical conditions continued throughout the Eocene, with oceans teeming with fish, turtles, and crocodiles. The marine fauna was enriched significantly during the early Eocene by the debut of three important animal groups which still survive to the present day. The first requiem sharks (Carcharhinidae; the family which contains Tiger Sharks, Bull Sharks, Oceanic Whitetip Sharks, and others) appear during this time. 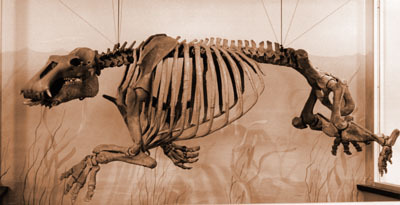 The first sirenians (manatees and dugongs; herbivorous marine mammals of shallow waters) evolved off the coast of Africa around 55mya, having branched off from the ancestors of today’s elephants. By far the most significant new arrival of the early Eocene were the first whales. The first whales would have had a lifestyle very similar to that of today’s seals and sea lions, feeding along the coastal waters and returning to the land periodically to rest and give birth. The late Eocene Basilosaurids became the first whales to become fully incapable of returning to the land. For the first time, mammals had become the top predators of the oceans. The toothed whales and baleen whales appeared during the latest Eocene. Meanwhile, the earlier walking whales appear to have disappeared by 36mya, corresponding with the spread of the marine Gavialids (a family of narrow-snouted crocodilians of which the modern Indian Gharial and False Gharial are the only survivors). Dourodon atrox, a basilosaurid whale of the late Eocene. Two significant tectonic events occurred during the Eocene; India collided with southern Asia around 45mya, and Arabia connected with west Asia 34mya around the Eocene/Oligocene boundary. As a result, the Tethys Sea had disappeared, possibly setting in motion the cooling trend that continued from the Oligocene to the Pleistocene. that includes manatees, dugongs, and sea cows. The Oligocene sees the beginnings of modern ocean circulation, with tectonic shifts causing the opening and closing of ocean gateways. Cooling of the oceans, and of the global climate in general, had already begun by the latest Eocene. This cooling trend intensified when South America finally detached from Antarctica during the early Oligocene and started to drift north toward North America. 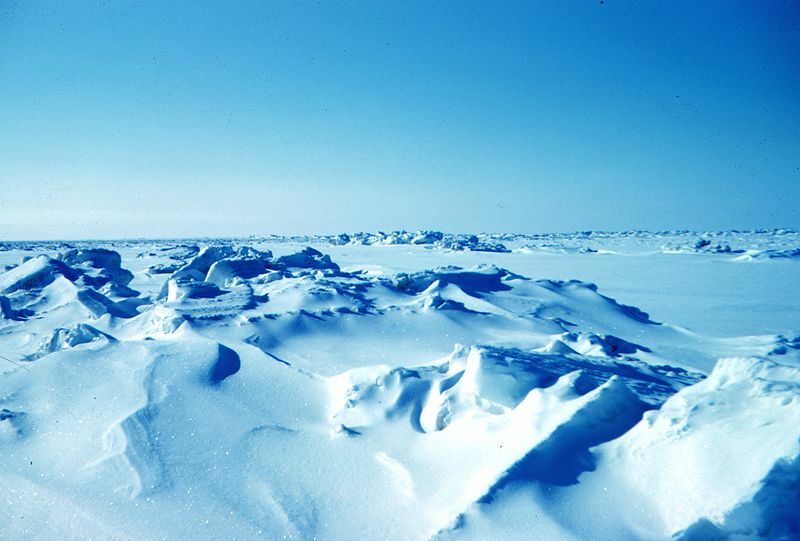 This allowed the formation of the Antarctic Circumpolar Current which rapidly cooled Antarctica and caused a permanent ice cap to form at the South Pole, although the fringes of the continent remained ice-free until the middle Miocene. 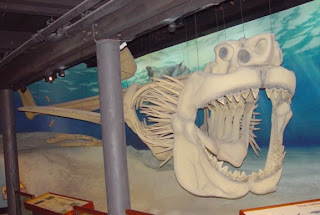 megalodon) on display at the Calvert Marine Museum. shark ruled the seas for almost 30 million years. The Basilosaurids had disappeared during the early Oligocene while the toothed whales and baleen whales continued to diversify. Among the toothed whales, the diverse extinct family of shark-toothed dolphins (Squalodontidae) persisted from the late Eocene, and by the late Oligocene they were joined by river dolphins (Platanistoidea), dolphins (Delphinidae), and sperm whales (Physeteridae). 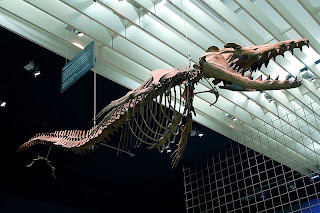 Among the baleen whales, the toothed Aetocetids also carried on from the latest Eocene, and by the late Oligocene they had given rise to the toothless Cetotheriids, of which the Pygmy Right Whale is the only modern survivor. Also, a new group of marine herbivores appeared in the fossil record during this time, the desmostylians. These animals appear to have been relatives of sirenians and early elephants, and may have appeared rather strange to a modern observer. When alive, these creatures would have resembled a cross between a sea lion and a hippo. In response to this great increase in prey diversity, the giant shark Megalodon evolved in the late Oligocene about 28mya, and would survive unchallenged until the Pleistocene. rocks off the coast of South America. 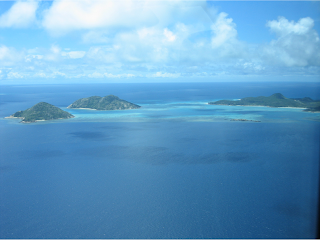 Further decreases in temperature occurred during the middle Miocene around 15mya, probably reflecting ice build-up in the Southern Hemisphere. Formally confined to the center of the continent, the permanent Antarctic ice cap expanded to its modern form at this time, covering the whole continent. the adaptive radiation of pinnipeds at that time. The Miocene cooling may explain the gradual decline of the marine gharials, which would continue to disappear into the Pliocene leaving behind only a few freshwater species by Pleistocene times. Their decline, however, matches an increase in the diversity of pinnipeds (sea lions, walruses, and seals). The first pinnipeds of the late Oligocene, Puijila and Potamotherium, were small and otter-like, not far removed from their basal Ursid ancestors. By the early Miocene these had given rise to the archaic sea lion Enaliarctos, which would itself give rise to a number of new species 16 to 14mya. The pinniped radiation also corresponds with the extinction of the giant penguins which had existed since the early Paleocene. 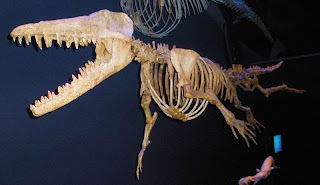 The Great White Shark as we know it today appeared 16mya during the middle Miocene, seemingly in response to the adaptive radiation of the pinnipeds. 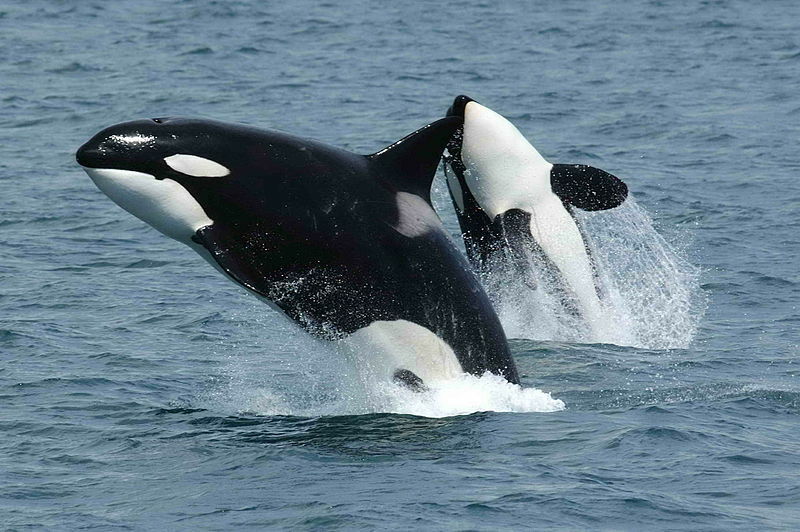 Cetaceans continued to grow in diversity as well. Porpoises (Phocoenidae), beaked whales (Ziphidae), rorqual whales (Balaenopteridae), and right whales (Balaenidae) all evolved in the middle Miocene, with Monodontids evolving later in the epoch. In spite of this increase in marine mammal diversity, the desmostylians become extinct during the late Miocene about 7mya. activity that would characterize the Pleistocene. Oceans were still relatively warm during the early Pliocene and subtropical conditions were present as far north as England. Another cooling event would soon transpire however. 3.5mya, the Isthmus of Panama formed when South America finally connected with North America. This event may have influenced the further cooling of the global climate; the once equatorial current which had been flowing since the Cretaceous had now been redirected to flow in a north-south course, causing cold waters from the north and warm waters from the south to mix and subsequent cold north Atlantic and north Pacific currents to circulate. Perhaps in direct correspondence, the Greenland ice cap developed during the middle Pliocene about 3mya and glacial activity would continue through the rest of the Cenozoic. surface waters following the extinction of Megalodon. Starting in the middle Pliocene, northern and southern parts of the world began to experience more pronounced, seasonal drops in temperature. 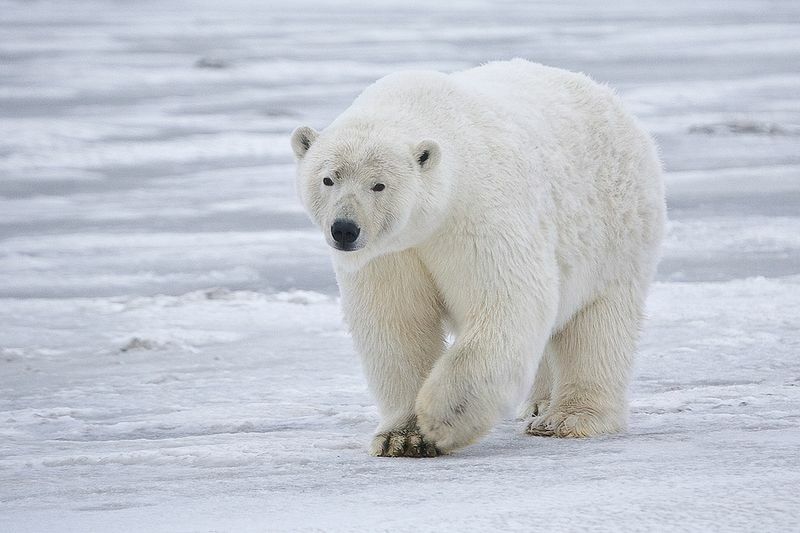 For the first time we see the evolution of truly cold-adapted land mammals such as bison, mammoths, and lynxes. Despite these events, the marine fauna remained largely unaffected. The majority of the animals around at the time would have been very familiar to us today with modern types of cetaceans, pinnipeds, sirenians, sharks, turtles, penguins, and sea birds. The Pleistocene was a time if great fluctuations in climate brought on by the continual advance and retreat of glaciers. This caused sea levels to drop by several hundred meters, polar conditions to extend further south, and colder and drier conditions worldwide. Megalodon persisted throughout the Pleistocene but disappeared toward the end along with several types of giant whales, sirens, and turtles. These animals may have died out as a result of the same event that decimated many of the land mammal populations 13,000ya. Being a large, pelagic, slow-breeding carnivore, Megalodon was particularly vulnerable to drastic changes in prey stocks, and so may have become extinct as a result. Those predators that hunted in deep waters or along the coasts were relatively unaffected because prey is more abundant in these environments. Likewise, the Sperm Whale, Killer Whale, and Great White Shark are now the largest ocean predators.